MP Safa Al-Hashem yesterday claimed the government collects no charges from expatriates in the country. Commenting on a response to her question by Finance Minister Nayef Al-Hajraf about value-added tax (VAT), Hashem wondered why VAT should be imposed on Kuwaitis when the government “collects nothing” from expatriates, who are three times the number of Kuwaiti citizens. Hashem has earlier called to tax expats for the air they breathe in Kuwait and for walking on the streets. Expatriates pay annual health insurance fees and an array of medical charges at public hospitals and clinics and are charged 250% more than Kuwaitis for electricity and water consumption. They are also charged for their work permit and residence renewals, in addition to several other charges. Expatriates are only slightly more than double the number of Kuwaitis and not three times more. 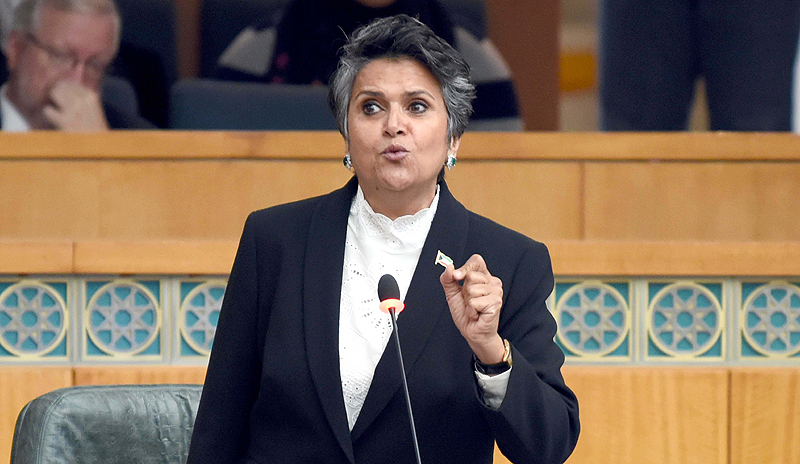 “Why do you want to impose VAT on Kuwaitis while we have a defect in the demographic structure, where expatriates are three times the number of Kuwaitis and the government does not charge them one fils,” she said during a National Assembly session. The lawmaker said there are 5,000 Kuwaiti debtors who are unable to repay their loans, adding that she only inquired about bad debtors and not all debtors. Meanwhile, MP Mohammad Al-Dallal said he had asked the former minister of social affairs and labour about maid recruitment offices, which have “become like gangs and a state within in a state”, adding he suspected that influential people back these offices because neither the ministry of commerce nor the social affairs ministry are capable of taking any action against them. He said the government established a company for the recruitment of maids but it has failed as the recruitment offices are more powerful than the government. Dallal said that the issue is important and deserves to be escalated, and the government should be held to account because it concerns every Kuwaiti home. During the debate, the assembly agreed to extend the duration of the public funds protection committee to continue its investigation into alleged violations in Al-Zour refinery. Lawmakers then approved a government-sponsored amendment to the housing law, in which houses of martyrs will be registered in the names of their widows. The Assembly meets again today.